Microsoft has released version 8 of Skype for the desktop, which features a redesign inspired by the app’s mobile clients. The update, which is available on Mac, Windows, and Linux, replaces version 7, which will no longer work after September 1, 2018. The update includes 1080p video calls with screen sharing for up to 24 participants. Twitter-style ‘@mentions’ have been added too. Mentioning someone by name preceded by the ‘@‘ symbol sends them a notification. Microsoft has also added a media gallery. Clicking on ‘Gallery’ in a conversation opens a panel on the right side of the Skype window with links, files, and other media that has been shared. Finally, users can share files, photos, and videos of up to 300 MB by dragging them into a conversation. Microsoft also updated Skype’s iOS apps. The update to the iPad version of Skype is noteworthy because it’s been about a year since it was last updated, and it now includes features that are in line with the more frequently updated iPhone version. Microsoft says it has other features planned for later this summer too. Skype will add read receipts that display avatars beneath the most recent message a user has read, so you can see at a glance where each participant in a conversation is. End-to-end encrypted audio calls and text messaging with file attachments based on the Signal protocol is coming later too. Perhaps the most significant new feature that Skype will introduce is cloud-based call recording that works with audio and video calls. When a recording is begun, each participant will be notified that the call is being recorded. This should be an excellent addition for anyone who has relied on third-party solutions or QuickTime to record Skype calls. Also, starting conversations should become simpler. Users will be able to invite new users to join Skype by sharing a link from their profile. In addition, shareable links to group chats will make it easier to add new members to a group. I’ve never been a fan of Skype’s Mac app. Unifying the app across different platforms undoubtedly simplifies Microsoft’s development process and will be useful to anyone who uses Skype on multiple OSes. The unification comes at a cost though. 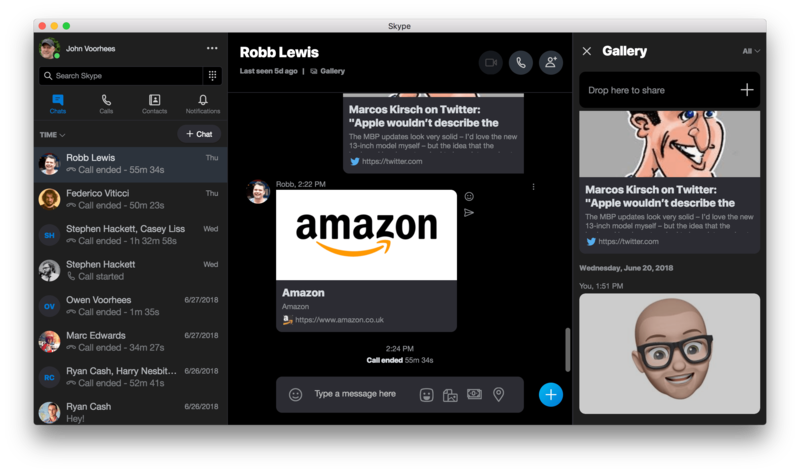 Skype 8 is a cross-platform Electron app based on Chrome OS, which means non-standard windows and controls on the Mac. Apps like Skype are why I’m looking forward to UIKit coming to the Mac. If it isn’t worth the effort to Microsoft to build a native AppKit version of Skype, a UIKit version on the Mac that is based on Skype for iOS should at least be more familiar to users.